Virco's complimentary PlanSCAPE® service identifies and delivers a furniture solution for a new state-of-the-art K-12 school. When the new Kiowa County Schools facility in Greensburg, Kansas welcomed its students, it wasn't a typical first day of classes. That's because the state-of-the-art K-12 building - furnished by Virco's PlanSCAPE® team - was replacing the temporary classrooms that had served the community since 2007 after a massive tornado roared through Greensburg. 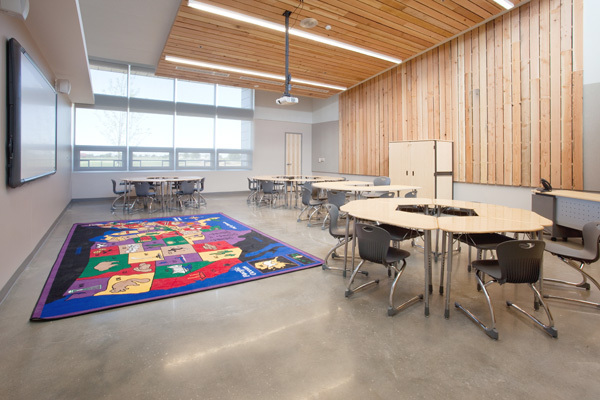 The new K-12 building was constructed as a LEED Platinum project and the school administrators approached the furniture selection process in a thorough manner, identifying the facility's complete furniture requirements. The Virco team met with the school administrators and discussed the advantages of Virco's product line, and our PlanSCAPE® possibilities for furnishing their entire building. PlanSCAPE® provided custom solutions for the many areas of the Kiowa County School's facilities and classrooms. The new Kiowa County School Building included a unique blend of standard and custom Virco product. The school relied on Virco's PlanSCAPE® team to supply custom furniture solutions for its building, including shelving and soft seating for the library and innovative meeting tables with high-volume storage beneath the work surface for faculty and staff workrooms. Student seating consisted of award-winning ZUMA® Cantilever Chairs with an ergonomically sculpted shell. ZUMA® Cantilever Student Desks with spacious bow-front work surfaces were chosen for the high school, and kindergarten through 8th grade environments featured ZUMA® ZHEX models. As a complement to the best-selling standard Virco furniture in the classroom, the facility's three workrooms for faculty and staff members were equipped with custom, special-order products. 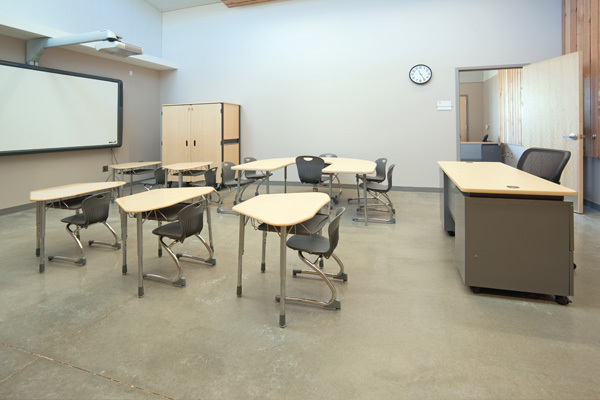 These two classrooms in the kindergarten through 8th grade show the versatility of our ZUMA® ZHEX desks. As the left photo indicates, these units can be arranged in 6-desk hexagon-shaped pods; the desks can also be configured in other collaborative learning groupings. In addition, as the right photo indicates, these desks can be readily aligned in rows for testing and individual learning. To complement the ZUMA® ZHEX desks, the classrooms feature a 4000 Series Deep-Center Horseshoe Activity Table, a Mobile Cabinet for storage and a Parameter® Teacher Desk. 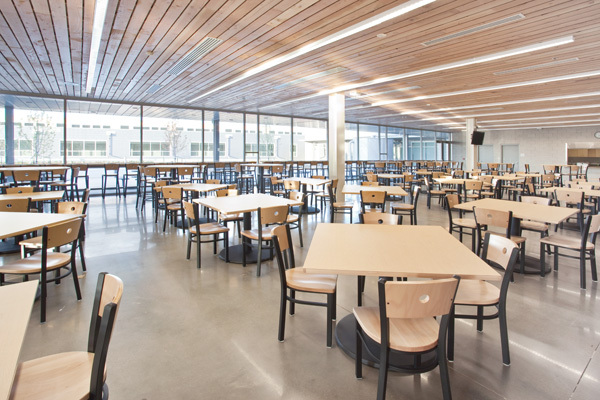 Our PlanSCAPE® Team was able to coordinate the cafeteria furniture's wood surfaces with the Fusion Maple laminate and hard plastic surfaces used on the facility's Virco Classroom Furniture. 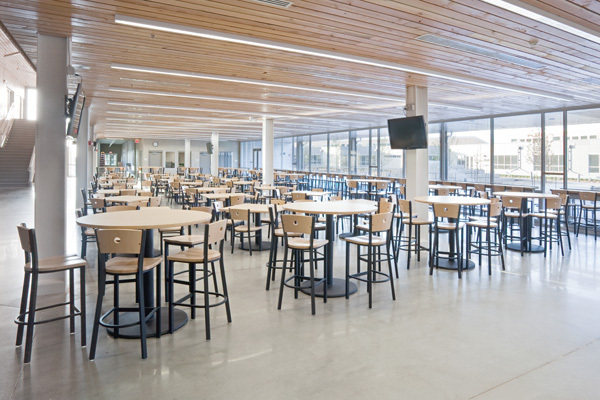 When equipping the building's faculty and staff workrooms with custom tables, the PlanSCAPE® team matched the tables with the bar stool type chairs identical to those in the cafeteria - providing another facility-wide furniture tie-in. Our PlanSCAPE® project included furniture solutions for specialty classrooms. 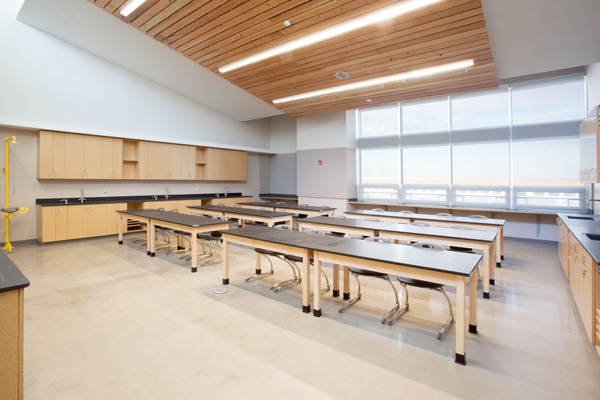 The high school science lab (pictured at left) features ergonomically supportive ZUMA® ZCANT Chairs and sturdy wood-frame science tables. 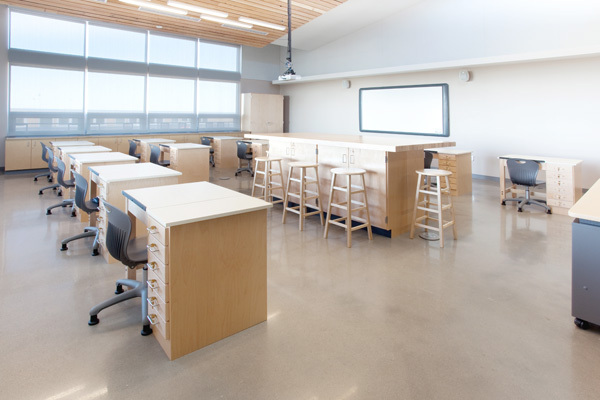 The high school art room (pictured at right) is furnished with custom individual workstations and a central multi-student station; seating is provided by ZUMA® Task Chairs with optional fixed glides and custom, solid-wood stools. "Virco did an outstanding job helping us furnish our district's new K-12 building; I'd definitely recommend their PlanSCAPE service. The Virco people who worked with us were exceptional." "Before choosing Virco, our district's two principals and I met with a number of furniture vendors and evaluated their products. At first we had every intention of going in another direction, but after looking at what all the vendors had to offer, we decided to go with Virco." "Virco's greatest strentgh is their people, even more than their products and their pricing, which are also strengths. No one else offered us the same level of service that Virco has given us."